The IEEE Global Communications Conference covers the entire range of communications technologies, offering in-depth information on the latest developments in voice, data, image, and multimedia. Get your communications products and services in front of several thousand focused buyers-the most influential design and development engineers in the world. A strong technical program is planned, with technical symposia focusing on technological trends in recent communication research and development from academia to the industrial laboratories throughout the world and tutorials and workshops addressing emerging technical and business issues in communications technologies. IEEE GLOBECOM 2009 also features keynote speakers each day in the CEO, Industry Leader and Technology Leader Forums, sharing visions significantly impacting the future of the world's telecommunications industry. Several Business Forums will be held including panel sessions on IPv6, Design & Development, Enterprise Networking and Access featuring high level executives and leaders addressing challenges, opportunities, and the future of the industry. If Your Company Manufactures/Supplies Any of These Products / Services, 2009 IEEE GLOBECOM is for you! 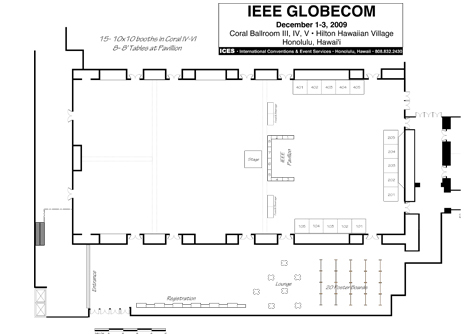 If your company manufactures or supplies products and services related to components, subsystems, and systems (including hardware, software, and middleware) in any of the following areas, you need to join 2009 IEEE GLOBECOM in Honolulu! If your company offers services in any of the following areas, you need to join 2009 IEEE GLOBECOM in Honolulu! Tutorials offer education for keeping up with new and emerging topics essential to today's engineering and technology environment. telecommunications, the outcomes of the divestiture process - 25 years after, and important contributions of telecommunications to humanity made during the 125-year existence of the IEEE. 2009 IEEE GLOBECOM Expo is sponsored by the IEEE Communications Society. With its 45,000 members, the IEEE Communications Society is a diverse community of industry professionals with a common interest in advancing all communications technologies.It promotes the advancement of science, technology and applications in communications and related disciplines. It fosters presentation and exchange of information among its members and the technical community throughout the world. The Society maintains the highest standard of professionalism and technical competency.